Not wanting to let the recent school holiday over without going anywhere, I planned for a short trip to a town in the southern part of Malaysia: Kluang. Kluang is chosen because we have almost visited other parts of Malaysia and what is left unexplored and overlooked is Johor – the state which Kluang is situated. This 2D1N trip started last Friday. It took us 3 hours to reach Yong Peng from Kuala Lumpur. From North South Expressway, we exited Yong Peng. One of the reasons we went to Yong Peng was to meet up with my wife’s ex-schoolmate. Another reason was to visit this small town that is famous with Fuzhou food. Our first stop was none other than the famous Fuzhou (or Foochow) bakery. This place is popular among visitors for its kong pia and misua (or mee sua) – two Fuzhou specialties. 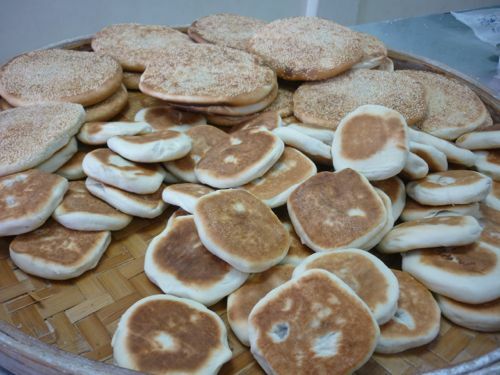 There are a few varieties of kong pia: plain salty, plain sweet, wholemeal sweet, sweet stuffed with peanuts (the staff at the bakery told me it’s called lao po bing 老婆饼). We unanimously vote for the sweet version. The sweet version has the right sweetness but the salty ones are too salty. The biscuits are softer than the ones I bought from Sibu. I like Yong Peng’s kong pia better. The prices range from RM0.60 – RM0.70 a piece depending on varieties. The best part of this shop is you get freshly baked biscuits that are hot from the oven, literally. Or at least, you won’t get overnight biscuits. 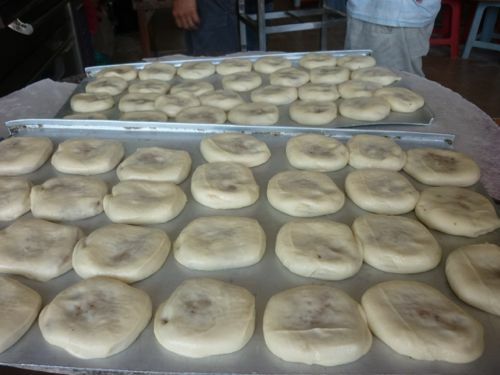 The biscuits are made and baked next door and you can bring your kids to see first hand how they make those top-selling biscuits by hand. Note: But if you are very particular about hygiene, you might want to pass on this shop. Because when we were there, we spotted some flies hovering and stopping on the biscuits. 14, Main Road, Yong Peng, Johor. Directions: The shop is easy to find. From Yong Peng exit, it’s located on the right after entering the town. The bakery was still open at 6.30pm when we passed by on the way back home. After having lunch with my wife’s friend in Ayer Hitam, we went to Tang Chuan Coffee Shop to buy big pau (Chinese steamed buns). I didn’t know about this shop but I was told the pau here is awesome by a lady at Eng Hin Bakery. Since we were there, I didn’t want to let this opportunity pass us by. We bought 2 to try. 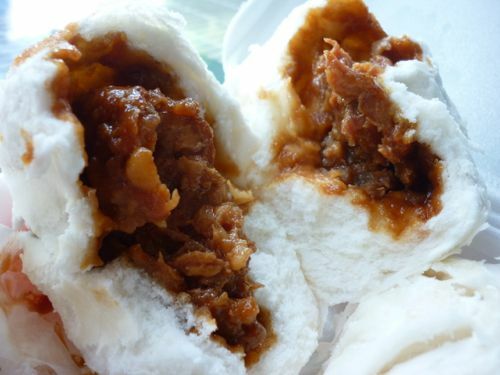 True to what’s claimed by the lady, the pau is solid and tasty. Chunky, succulent pork forms main part of the filling. It’s worth a try. Second shop on the left from the cross junction (the only traffic light in Ayer Hitam town) heading Batu Pahat. This is one of the highlights of the trip. At first, I thought this organic park came with free entrance, as told by my friends. Upon checking out, apparently Zenxin started charging visitors since last August. Free entrance no more. I must say the fees are not cheap and I wouldn’t have visited this place if I knew this much earlier. 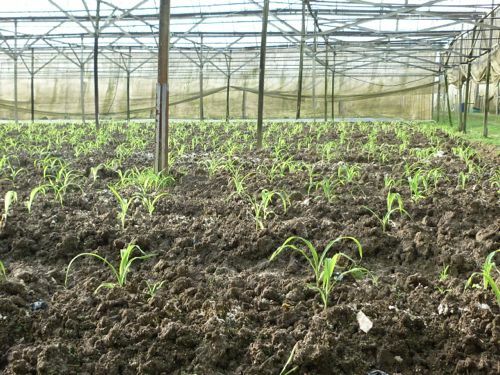 As I have many other alternatives for organic farms in the Klang Valley. Trying to make it up for the fees, a staff tried to explain why they charge the amounts they are charging. The fees include free guided tour, archery for adults, feeding rabbits or fish for children, goodie bag, or ice-lolly. If you ask me, I just want to visit the farm and I don’t want the bells and whistles that come with the fees. 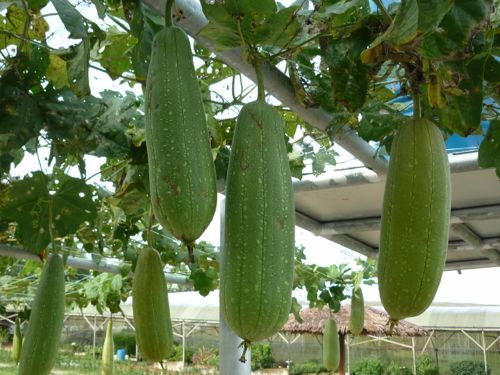 Anyway the park is big and it has many varieties of plants that children can learn from: dragon fruits, passion fruits, mulberry trees, mushrooms, herbs, vegetables, and even small animals such as rabbits, geese, and ducks. Bicycles are available for rent at Zenxin but I’d advise not to because the farm is hilly and it’s hard for small children to cycle around the place. The best way to visit the organic farm is to join one of its guided tours. The times for guided tours are 9.30am, 11.30am, 2.30pm or 4.30pm. Each tour lasts for an hour. If you can’t stand the heat, it’s better to join the 9.30am or 4.30pm tour. There’s a farm mart at the entrance to the park where you can buy some organic produce home. Look for bargains there. We bought a bitter gourd for RM2, 2 cucumbers (small) for RM2, 7 passion fruits for RM6. Feeling thirty and hungry? There’s a restaurant waiting for you to savor its simple but delicious local meals and drinks. I find the prices at the restaurant are highly reasonable. Also available at the cafe is steamboat. But we didn’t have our steamboat there but at another Zenxin outlet near Kluang town. More about this later. Here’s a tip: To find out their latest promotions, check out their Facebook page, not their official website at zenxin.com.my. We learned this from a staff at the ticket counter. Because I only checked out its official website before I went, we almost missed its promotional family package that we needed to book 3 days in advance. The package saves you RM16. Plot 47A & 47B, Batu 9, Jalan Batu Pahat, 86000 Kluang, Johor. Directions: Again to get to Zenxin, it’s easy peasy. Take Ayer Hitam exit from North South Expressway. Turn right after the toll. Just follow the way to Kluang town. And for about 15 minutes’ drive (maybe less), you’ll see a huge signboard telling you that you have reached Zenxin, on your left. Farm Mart: Weekdays 8 am to 8 pm. Weekends and Public Holidays 8 am to 9 pm. RM10 adult, RM8 child, 3 years and below free. Cycling packages RM10 for both adults and children. It’s good to have friends who know inside out about a town. From an “insider” tip we got to know this restaurant which offers free flow of organic vegetables for its steamboat dinner. Beware: Not all Zenxin restaurants are created equal! There are 3 Zenxin restaurants in Kluang and mind you every one of them has different pricing. The other two charge you per pax (organic park and Kluang Mall) – the buffet style. But the one that we went to only charges you for soup RM2/pax and what you eat (except that organic vegetables are free). There are about 5 types of vegetables to choose from and you can have a choice of plain, herbal, or tom yum soup. The soup is not as good as what I expected and I wish the restaurant could prepare the soup from scratch with natural ingredients (not from pre-packed sachets). I prefer the plain version of soup though. Besides that dragon fruits seem to be the main star of drinks offered at the restaurant. You can chose from an array of different variations of dragon fruit drinks. The restaurant was packed after 7 pm and it looks like it is popular among locals. 36-42, Jalan Berlian Dua, Taman Berlian Biru, 86000 Kluang, Johor, Malaysia. 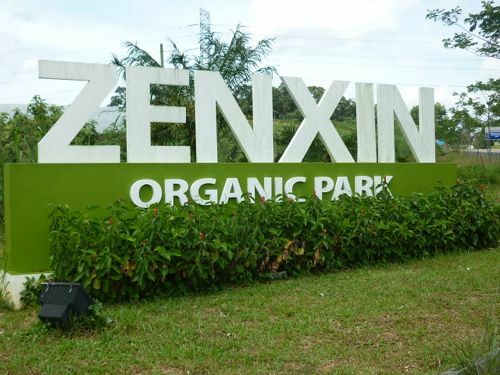 Directions: From Zenxin Organic Park, the restaurant is located on the left after the 5th traffic light – right before reaching Kluang town from Ayer Hitam or Batu Pahat. When our Kluang friend (yes the insider) recommended us Rail Hotel, we jumped at it without hesitation. We trusted his choice. What else do we ask for when the stay comes with a complimentary breakfast at the famous Kluang RailCoffee downstairs. For the breakfast, you have a choice of a main dish plus a drink. We tried its half-boiled eggs but I find the eggs were disappointingly overcooked. We also bought home some coffee powder: 500g for RM14 and 16 sachets for RM8.50. 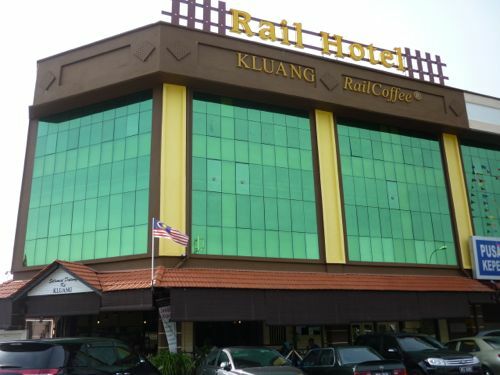 The little-known boutique hotel (the hotel is owned by the same owner of Kluang RailCoffee) is relatively new and it has 19 rooms – located above one of the branches of Kluang RailCoffee. We wanted to book a Family Room but it was not available. Instead we took a King Size room with an extra bed. The main bed is comfy but the extra bed is sub-standard. Even though it came with a portable bed, I could feel the bed when I slept on it as the mattress is too thin and soft. Other than that, the room is clean and new. We don’t need facilities of a 5-star hotel but a nice and quiet room for us to recharge is sufficient. If you are like us, Rail Hotel is an option worth considering though the rates are not the lowest. Overall we are satisfied with the hotel. And the staff was very helpful. Initially I wanted to have Kluang map (which I found in a directory in the room) photocopied. But after thinking for a while, he offered to give the directory to me (the book costs RM10) – which he was not supposed to do. I hope he would not have any problems explaining the missing copy of the directory to his boss. 20 & 21, (1st & 2nd floor), Jalan Tasik 1, Pusat Perniagaan Tasik, Kluang, Johor. For enquiries and reservations, call 07-772 8391/012-711 5435 or fax 07-772 8390. Extra Bed – RM45 nett with breakfast. 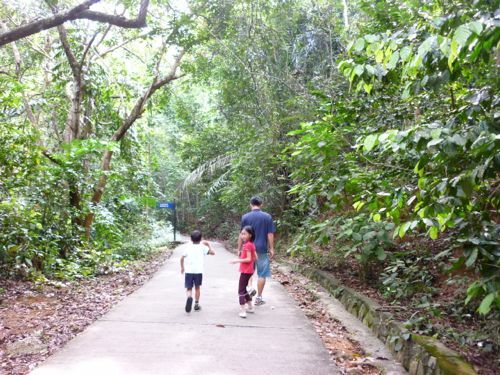 This is the go-to place for Kluang’s nature lovers and trekkers. When we reached Gunung Lambak after our breakfast at Kluang RailCoffee, we saw a few people (mainly retirees) already coming down from the mountain. I was told it takes 2 hours to reach the mountain top. The place is cooling and it has a short stretch of concrete path starting from the entrance. We didn’t go far and left the place after taking a few pictures. If you need some cold drinks, snacks, or fruits, there are a few stores located near the entrance of the trek. Gunung Lambak is off Jalan Kota Tinggi. Follow the signboards to reach the foot of the hill. We found this place from the map that we got from the hotel. It’s not part of our initial itinerary though. We were not sure if the farm accepted visitors but we went in anyway. After checking with one of the workers, they do accept visitors. But we had to tour the farm on our own since it was not a pre-booked tour. 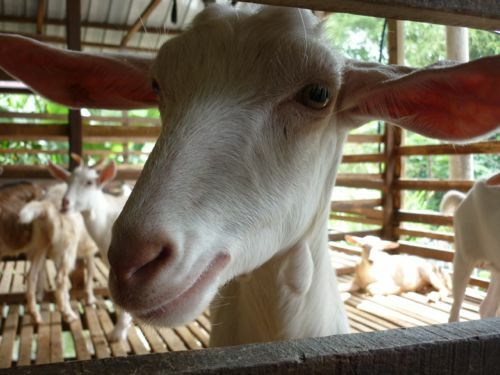 The farm’s main purpose is to produce fresh goat milk. We went up to the shed and had a close up look at the animals. K particularly liked the experience. How can you leave the farm without trying its products? Before we left, we bought a bottle of goat milk (filtered but raw and unprocessed) for RM4.50. The milk tasted like cow milk with no strong “milky” smell. 160, Jalan Yap Tau Sah, 86000 Kluang, Johor. Directions: LA Farm is located not too far from Gunung Lambak. There are clear signs leading up to this wonderful place. 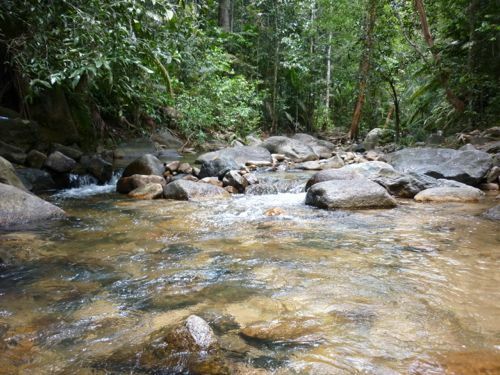 But getting there requires patience as it is located quite remotely from Kluang town and it’s located next to a Felda settlement called Ulu Dengar. 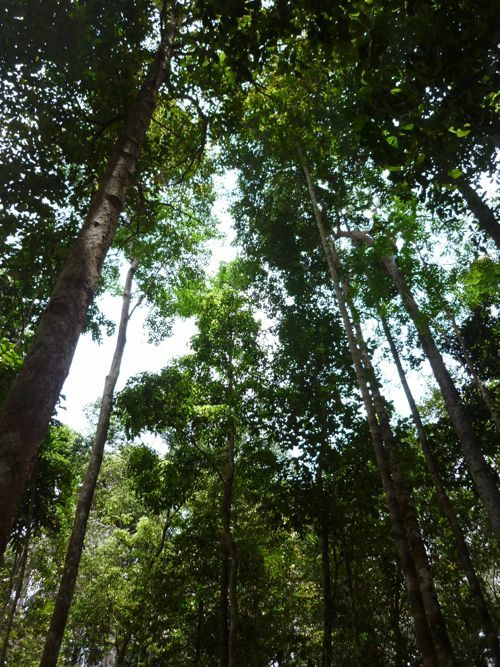 The forest reserve is hidden and located at the end of oil palm plantation which was leveled. This sanctuary of flora and fauna turns out to be the most favored place for J and K of the entire trip. We wanted to look at the waterfalls of Gunung Berlumut. But since you have to hike up quite a bit, we didn’t go that far. We simply picked a nice spot which was a little upstream for J and K to take a dip. The water in Gunung Berlumut is crystal clear and it attracted many people that day. Gunung Berlumut is an ideal place for BBQ, picnic, and of course splashing. If you do nothing but just enjoy the peaceful atmosphere of the jungle, listening to the chirping sound of the birds, or admiring the tallness of trees that took years to grow, it already makes the visit worthwhile. Directions: Gunung Berlumut is off Jalan Mersing. Located about 26km from Kluang town. I had a long list of Kluang food that I wanted to try but unfortunately the trip was too short. Hence, we had to sacrifice some. 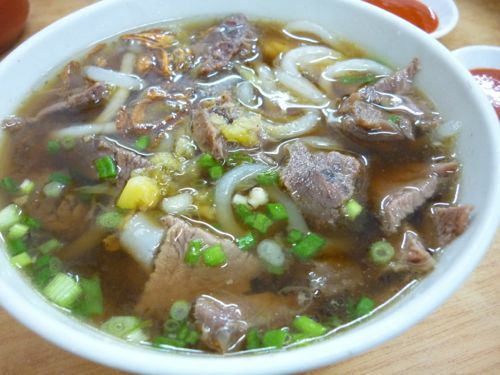 Since beef noodle is almost synonymous with Kluang, we decided to try Tangkak beef noodles – as the name suggests, it’s originated from Tangkak. We reached the restaurant about 4 pm and the place was still bustling with people. Tangkak Beef only offers soup based noodles but you can choose to go with your favorite noodles. I tried lai fun (laksa). The beef is tender and the soup is plain without the beefy smell. The beef goes very well with the chilli sauce provided. The beef noodles are alright but not superbly special. 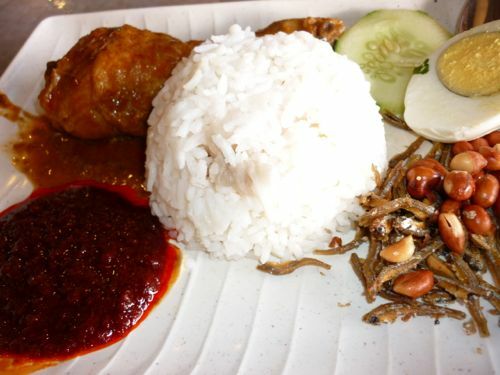 There are 4 different serving sizes: small (RM5), medium (RM6), large (RM7), and extra large (RM8). 5, Jalan Langsat, 86000 Kluang, Johor. 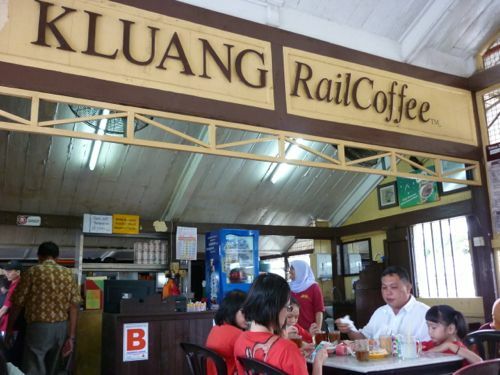 Located not very far from Tangkak Beef, a not-to-be-missed place for coffee lovers and toast is the popular Kluang RailCoffee at Kluang Railway Station. The eatery originally started in 1938 to serve train passengers at Kluang station. Now it serves coffee lovers from all over the country and beyond. Living up to its name, the place was crowded when we reached at 5 pm. Since we just had our lunch, we couldn’t eat much. 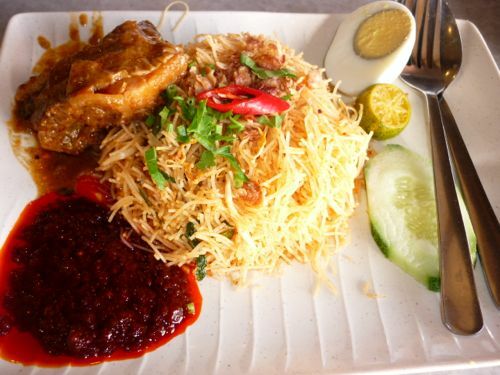 We just tried its bihun goreng bungkus – 70 sen (nasi lemak was snapped up all) – all gobbled up by J and K, toasts, and kopi O (hot coffee with sugar). This coffee shop is a true reflection of the Malaysian unity with patrons coming from every walk of life. I struck up a conversation with Uncle Lim who happened to be there for his daily tea fix. He’s the second generation owner and he was only a few months old when his father started this historical coffee shop. Now the shop is run by his nephew. Jalan Stesen, 86000 Kluang, Johor. Opening Hours: 7 am to 12 pm. 2.15 pm to 6 pm. Close on Thursdays.